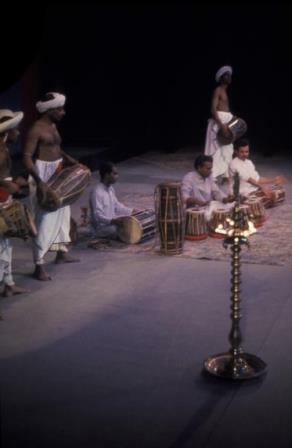 When the Chitrasena Dance Company first came to Australia it was 1963. I was still a student dancer and living in Sydney. The company performed at the Elizabethan Theatre, Newtown. It hadn’t yet burnt down (that happened in 1980), and in fact I remember the startling rake on that theatre’s stage. I had never performed on a raked stage when I danced there in some Ballet Australia performances. It was somewhat confronting stepping onto that stage for the first time, especially as no one had thought to tell me in advance. The 1960s and 1970s were heady times in Sydney and elsewhere for visits from so-called ‘ethnic’ dance companies. Along with the Sri Lankans, the Georgians came, the Mexicans (I remember in particular the Yaqui Indian Deer Dance), the Spaniards (I saw a jota for the first time) and the Mekeo dancers from Papua New Guinea. Then some time later, when I started working in various capacities at the National Library in Canberra, I discovered the photographic collection of Walter Stringer. In fact I had the pleasure of helping the Library acquire that material. He, being a Melbourne resident, had photographed most of the folkloric companies I had seen in Sydney during their visits to his home city. It has always been a pleasure to see those companies again when, or if, they have returned to Australia. So it was with the Chitrasena company when they made their 2015 visit. Below are two of Walter Stringer’s images from the 1963 visit. Here is the link to my review of the company’s performance in Canberra in January, written for The Canberra Times.